Tamla joined the Center for High Impact Philanthropy as the Program Coordinator in July 2018. Tamla comes with a long professional history of providing administrative, clerical and executive assistant support to a wide range of organizations and departments, including many at Penn. 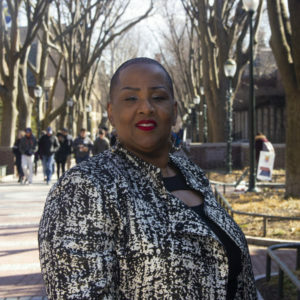 In addition, she has extensive experience as a business consultant, providing mobile notary, executive assistant and document preparation services for Philadelphia based small and minority owned businesses in various industries. Her high level of professionalism, close attention to detail and warmth make her a great fit for our organization. Tamla attended Fayetteville State University in Fayetteville in North Carolina. She received her Business Management certificate with discipline in Human Resource Management Specialist from Griffin Technical College in Griffin, Georgia. Tamla has been a volunteer tutor for the Mayor’s Commission on Literacy®, Women Business Development Center®, Career Wardrobe®, assists with organizations that coordinate expungement clinics and she helps seniors in her community. She also enjoys a wide array of music and cultural events throughout Philadelphia. Tamla raised three children to adulthood and now pet-parents a Staffordshire bull-terrier mix lovingly named Maxima.